There is nothing uglier than a yellow bike. It’s an unsettling color that just screams “Look at me; I’m trying way too hard!” Just wrap that obnoxious pale pigment around any custom build, and it either comes off as a piece of construction equipment or some feminine attempt at individuality. Failing miserably, it seems to turn any bike into a bird that if you saw it, you would want to hit it full force with a tennis racket. A color so foul that it can take any bike and make it a bile-inducing pile of ugly parts, a bike so nasty that if your friends saw you riding it, they would throw rocks at you and shame your family. All yellow bikes are ugly and should be systematically removed from existence to never again leave a child quivering and scared, the images of abominable ugliness that will forever taint what would have been a splendid youth. 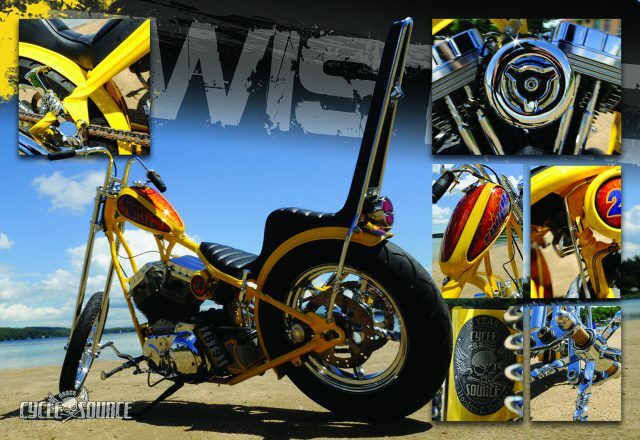 ALL yellow bikes are ugly…. except this one. When the word came down from on high, and it was time to build a giveaway bike with collaborators, Twisted Tea, it was known that the evil yellow would be the dominant color and to pull it off would be nothing short of a miracle. Starting the wheel in motion at Flat Broke Chops and Rods the build eased forward. This was to be the bike that marked 20 years for the magazine and would end up with one lucky reader for life, so they couldn’t fail. The project started with an excellent deal on a 1998 1200 Sportster in stock configuration. Before the wheels even hit the ground the skilled monkeys that make up the Cycle Source dream team gutted the bike, sent the motor and trans to Matt The Wrench for a good going through and reseal to make sure that the bike would be a reliable runner for the fortunate next owner. The decision was made to keep the drivetrain as stock as possible, so, except for a Daytona Twin Tech electronic ignition, all mechanical parts are in their stock configuration. Small sections of twists are incorporated into the frame. One section of the seat post, two parts of the rear frame section leading to the axle plates and two sections on the down tubes. Each section is simple and understated rather than elaborate and showy. This was a solid decision because with the color chosen they were already looking at a big yellow clown caresque build putting everything one extra twist away from being cheesy. Dangerous ground. By this time the whole show was packed up and moved to RJ Powell’ss place, Cutting Edge Customs which became Cycle Source Central for the duration of the build, even producing an issue of the magazine from inside the shop. Along with supplying the hardtail section and kicker, Led Sled Customs had a big part of the next stage of the build, the wheels. Based on a set of Led Sled Invader type wheels, Pat worked side by side with the crew. As the rest of the team were twisting the spokes, Pat would weld them in as they were made. The wheels are surprisingly light, weighing about the same as set of stock Sportster mags. They also balanced in without a problem. To fill in the gap on the roller they went with a springer front end by Twisted Choppers. The front legs are also twisted. A seat pan was tailored to fit, which they sent to Bare Bones Leather where Curt Green made it into the seat that now adorns it. The massive job of molding for paint and polishing for chrome was taken on by everyone that was working on the project as well as everyone walking through the door. Eventually, though the frame made it to Bob at Streets Customs for the paint and the rest went to Ride Wright Wheels where Sam did an exemplary job (as always) on the chroming. All the pressure in the world was on Bob Streets as he was left with the task of making the unfortunate color choice work. “I tried everything I could think of to get Twisted Tea to change their mind on the color choice, we all did. When that failed, I took the colors they had to have and after about a week of searching and comparing I finally just used my imagination and hoped for the best.” From there it was hours of custom taping and layering by all of them to get the design right. 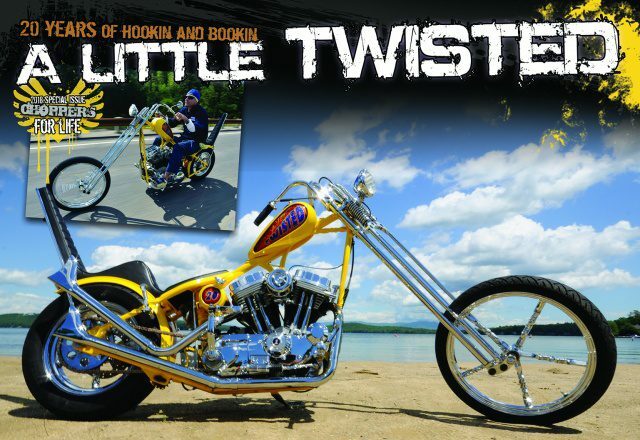 This entry was posted in Feature Bikes and tagged 20th Anniversary, A Little Twisted, Back Issue, Chopper, Cycle Source, Cycle Source Magazine, Feature bike, February 2018, Flat Broke Chops And Rods, Hookin And Bookin, sportster, twisted tea. Bookmark the permalink.